P&C council is concerned that Lyneham High School will have no dedicated school bus routes. File Photo. 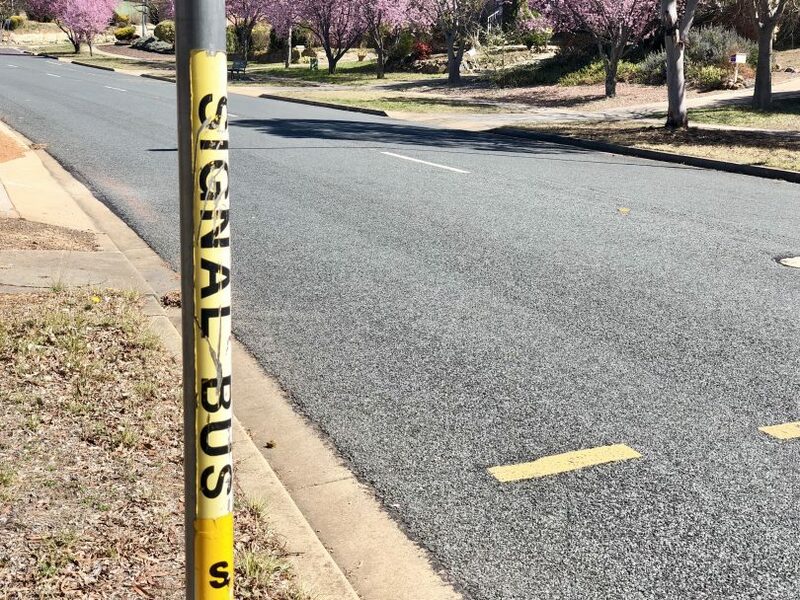 School students’ safety is being jeopardised at some schools by inadequacies in the ACT Government’s new bus network, the ACT Council of Parents and Citizens Associations say. The ACT Government released its new bus timetable on Thursday morning (14 March) before the network becomes operational in six weeks, with ACT Transport Minister Meegan Fitzharris saying the new network incorporates 10 rapid routes, light rail, new local routes and more buses servicing schools across the ACT. The network was met with opposition from the Canberra Liberals, with the Liberals transport spokesperson Candice Burch stating the new network will have fewer routes for schools and suburbs, with 59 schools to be left without a dedicated bus service. ACT Council of Parents and Citizens Associations spokesperson Janelle Kennard echoed those concerns and said the council was concerned that a child will be injured or killed crossing some of the “busiest roads in Canberra” to catch a bus home. Ms Jennard said students from several schools will be catching buses from stops at a range of distances from the school, rather than from existing bus stops at the front of the school. “Our concern is not so much the distances the students will have to walk to get the bus – up to half a kilometre – but that groups of teens will need to cross busy roads, some well outside the school’s 40 km/h zone, and will need to make detours to safely cross at pedestrian lights or underpasses,” she said. “We also know that teenagers are poor at assessing risk and that this is worse in groups of peers. Ms Jennard said the most dangerous example is Lyneham High School, which currently has 10 dedicated school bus routes but in the new network will have none. Not a single regular route will service the school directly either, with the closest buses stop at the new Dickson interchange on Mouat street. “Transport Canberra tells us that Lyneham High needs no dedicated buses because of its proximity to the Dickson interchange and light rail corridor,” she said. “Why then will Daramalan College, which is a similar distance away from Dickson, but reached without crossing Northbourne Avenue, have six dedicated Transport Canberra school routes taking students directly to the school gate? Rebecca Russell true of your kids! Yes! It's so disapointing that so little thought was given to the safety of kids with the changes to the bus routes. It may be possible for Lyneham High students to walk to and from Lyneham Primary school and catch their school buses to various places. It is a bit weird how for instance the school bus service that currently leaves Belconnen station in the morning for Brindabella Christian College, Lyneham High and Dickson College now just stops at Brindabella with a short hop down the road to Lyneham Primary for some reason. Why not continue it on to Lyneham High and Dickson as it does now? I’m curious why a school bus from Belconnen should be going to Lyneham High and Dickson college in the first place. Any school buses to those schools should be within the entitlement area not to out of area locations. There was also a similar one in the Crimes yesterday about a school bus from Fadden to Alfref Deakin high. Again not in or even close to being in area so why should there a school bus? Want to send kids out of area (and that includes private schools) then transport should be the parents problem factored into their decision to go out of area and for private schools it should be the schools problem. Lyneham has a number of ‘excellence’ programs open to any student not just those in area. So parents have made decision to send kids there based on these programs and the fact school buses were available that had safe drop off and pick up points and efficient timings. Now these bus services have all been taken away so faced with choice of longer, less safe travel or moving kids to a local school mid way through year after kids have settled in. My kids can get to school in the morning with no problems but getting home in the afternoon is a different story! They will have 4 minutes from the bell going to walk through the school, cross the road and walk further up to the stop. Not going to work! Daramalan has lost most of its dedicated buses too. Almost all of the few that remain go to Gungahlin only. Belconnen students have lost out big time and will be there at the Dickson interchange with Lyneham High students. When I used the new trip planner, it suggested that my kids walk 10 minutes from home, cross Belconnen Way (v. Busy!) to Calvary Hospital, get on a rapid to near Radford College, cross College St., then catch another rapid to Dickson. Crazy. Alternatively, they can catch a bus to Civic, then the light rail, then cross Northbourne and walk to school from there. This takes a lot longer than their current 40 minute trip. My youngest is 12 years old, by the way, and I don’t really want him enduring this sort of complicated travel each day. How much longer than the current 40 minute trip are these options? The first trip does sound a little convoluted, but the second sounds pretty simple, even for a 12 year old. If it isn’t much more than the current 40 minutes, I’d say they are not too badly off, especially compared to some others. David, you're right, there are a lot who are worse off, and they are no doubt more annoyed by these massive changes to how Canberra's public transport has always run. However, we chose to live fairly close to our kids' school (Aranda to Dickson is 7 kilometres, though busy roads between, so riding a bike to school is a little complicated) and hence a 40-plus minute bus trip is a little crazy. Sonia Bowditch it’s not your local school either. Walking ten minutes to Calvary and catching two buses isn’t complicated, even for a year 7 student. He can even choose to go via Civic or via Bruce. Morgan Hitchcock I don’t see how not being my local school is relevant. I don’t think this Labor town is quite so communist yet that we can’t choose our own kids’ school. Plus there’s walking at both ends, waiting for connections, all with heavy laptop-laden bag. Should be nice on a -5 degree Canberra morning. Of course it’s relevant, it’s not your closest school, or even second closest, or third closest. There is also no bus from Aranda to Karabar High School, should taxpayers have to fund that as well? There is a limit, this isn’t a communist state after all. Sonia Bowditch could you clarify how long the new trips are projected to take compared to the current 40 minute trip (including transfer time)? I think that context could help to demonstrate your point. Sonia Bowditch I feel your frustration. We live Weston Creek and my daughter is year 7 at Dara. The new suggested bus route has her walking and crossing a 6 lane highway(hindmarsh dr) into the next suburb to catch a bus to then hopefully meet up with every subquent bus to make it to school on time. And yes before anyone comments that Dara is not our "local school" weston creek does not have a private high school.